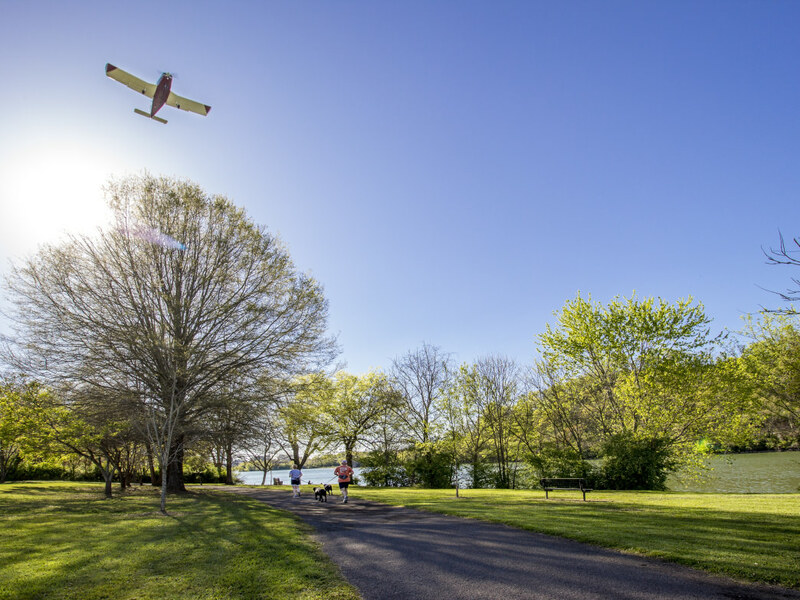 With outdoor meccas like the Urban Wilderness and the Tennessee River easily accessible from downtown, Knoxville has become one of the best cities for finding outdoor adventure in the United States. Add to that the proximity of the Great Smoky Mountains National Park and the Obed Wild and Scenic River, and you’ve got a shining example of a place where you can immerse yourself in nature without even leaving the city (or at least without going very far). Regardless of your passion or experience, Knoxville is an enviable base camp for all things outdoors. Here, is a general overview of Knoxville’s epic adventure scene. Urban Wilderness If you love to pound the pavement (or the dirt), then you’re in luck—it seems as if Knoxville’s city planners had you in mind as they designed this trail-rich city. Just 10 minutes from town, the Urban Wilderness is a 1,000-acre constellation of city parks and green spaces. Forty-two miles of trails thread through this recreational mecca, including a lovely 12.5-mile loop that connects several parks and trail systems together. Will Skelton Greenway Only 2.7 miles from downtown, the Will Skelton Greenway keeps the local roadrunners entertained. This 3.5-mile paved trail parallels the Tennessee river, runs through the Ijams Nature Center and past Meads Quarry, and concludes at the Forks of the River Wildlife Management Center, yet another swath of wild land filled with trails for running and mountain biking. What might begin as a quick, 7-mile out-and-back run could turn easily into an entire day of exploring! IC King Park IC King Park is another prime running destination, with about eight miles of trails to explore. There are mellow paths that follow the shoreline of the Flenniken Branch, an inlet of the Tennessee River, and steeper, more technical routes higher up. Like so many of the trail-laced wild spaces around Knoxville, IC King Park is a quick and convenient destination, only 5.5 miles from town. Haw Ridge There’s a lot to love about the 780 acres of the wild and wooded Haw Ridge, and for mountain bikers, it’s the 30 miles of singletrack that weave them together. Here you’ll find all the good stuff—tough climbs and soaring downhill, roots, bumps, and berms. If you’re new to the sport, you’ll especially enjoy the gentle, scenic trails along the water. With all the trails and turns in the park, it can be easy to get lost, so make sure you take a map with you! Baker Creek Preserve Next up is the Baker Creek Preserve—a 100-acre property that was recently added to the Urban Wilderness. There are 7.1 miles of trails here, with three mountain biking downhill trails, including the Devil's Racetrack Downhill Trail. The 0.6-mile singletrack Devil’s Racetrack was built thanks to a Bell Helmets/IMBA, and is an advanced mountain biker’s dream come true. You’ll start with a wall ride then get into berms, drops, gap jumps, and rock gardens. Onsight Climbing Gym Knoxville’s newly minted indoor climbing gym, Onsight, is a great place to learn the ropes (literally), and to get in a few routes after work. There’s a 50-foot lead wall and a bouldering area, too. The climbing gym is the perfect setting in which to gain confidence, train for your next project, and find new climbing partners. River Sports Climbing Center River Sports is known around the city as a gear shop, but the Sutherland Avenue location also has a fine indoor climbing facility. The gym has 35-foot walls, and both lead and top-roping lines for beginners and advanced climbers alike. You'll also find a bouldering area, which makes this place great for working on your technique or to learn a new climbing skill no matter what your style might be. Ijams Nature Center The Ijams Nature Center, part of the Urban Wilderness, boasts Knoxville’s only outdoor crag with 12 routes for leading and top-roping. Just five miles outside of town, this cozy crag has moderate grades on natural rock. Obed Wild and Scenic River If climbing is not already your top favorite sport, here’s a good reason to become a convert—Knoxville is home to one of the best climbing areas in the state, if not in the United States. Rope gunners from all over the world flock to the Obed Wild and Scenic River to get a taste of its sweet overhangs. The Obed features over 1,000 routes, enough to keep you occupied for a lifetime! Not to mention the sandstone Lilly Boulders, with about 150 established boulder problems, and the opportunity to put up your own lines. Although there are projects for all levels including beginners, you’ll probably want to find a local friend or guide to navigate this extensive sandstone wonderland of overhanging rock. After a long day of climbing, sit back and relax at Del and Marte's Lilly Pad Campground—it's both climber and dog friendly. Greenway System Knoxville’s extensive greenway system is a source of tremendous pride for the city. Sixty-five miles of paved loops and trails make up the greenway network, and it’s popular for both commuters and recreational cyclists. There’s no better way to explore the city’s parks, neighborhoods and shopping areas than by cruising peacefully along this safe and scenic pedestrian corridor. House Mountain State Natural Area Fourteen miles from town, House Mountain State Natural Area offers a nice variety of enjoyable cycling routes. Being the tallest peak in Knox County at just over 2,000 feet, Using House Mountain as a starting point will give you some taxing climbs, but is also quick to charm you with miles of scenery. You’ll pedal past open farmland, clear streams, and canopied forest, with the distant Clinch Mountains as a backdrop. Corryton Park Corryton Park is another great place to use as a homebase for your ride. It provides access to innumerable miles of low-traffic back roads, and you can head east to connect with House Mountain. Tennessee River Those who appreciate the meditative or athletic merits of canoeing, kayaking, and stand up paddle boarding, will find ample opportunity to get out on the water. To begin with, the Tennessee River rolls right through the heart of downtown Knoxville. Put-in at the Riverside Landing Park after the workday and enjoy an evening paddle through a dynamic landscape. Because of the gentle current, you can travel in either direction. Head upstream for a setting that is more natural and calming, then glide back down to see the cityscape lit up with hundreds of office windows reflecting the sunset. Urban Wilderness You can also paddle inside the Urban Wilderness—we’re not kidding when we say that place has everything. With its gorgeous water and marble cliffs, it’s no wonder that Mead’s Quarry Lake is such a popular spot for boating and stand up paddleboarding. You can even rent your equipment on-site through River Sports Outfitters. Seven Islands Wildlife Refuge The Seven Islands State Birding Park/Wildlife Refuge is a beautiful place to explore, particularly if you enjoy birdwatching. One hundred and ninety different species of birds have been identified inside this 416-acre park. You’re likely to find a little seclusion in this out-of-the-way gem, which is about fourteen miles outside the city. From the put-in just before the parking area, it’s a four-mile paddle down a smooth, pristine section of the French Broad River to Cruze Landing. Here the river breaks into channels that flow between the seven small islands, creating a series of coves and inlets that beg to be explored by water. Ocoee River Only a 1.5-hour drive from the city, the Ocoee River is a world-class paddling destination. In fact, it is one of the most popular rivers in the world for whitewater sports, attracting over 25,000 people annually for kayaking and commercial rafting trips. The Middle Section features five miles of continuous class III+ rapids, with some juicy holes and bouncy wave trains. The Lower Section is open and broad, an ideal trip for families, tubers and brand-new paddlers. This nearly six-mile run is filled with class I-II rapids that are gentle, playful, and fun. The Ocoee River makes for a great weekend getaway, and nearby camping at Gee Creek Campground makes it pretty easy, too. Tellico River Another iconic river, the Tellico, is about 60 miles from the city. The Upper run is a punchy two-miler known as "The Ledges". This section is short but sweet, featuring a series of fun drops and rapids, including Baby Falls, which is about 15 feet high. These class III+ (and one class IV) features are usually friendly and clean, however, at high water they can turn mean and sticky. The Lower Tellico has picturesque scenery and a few miles of quality class II-III rapids. With multiple access points and convenient roadside access, this is a wonderful section for paddlers to gain skills while feeling comfortable on the river. For an extra challenge, put in a bit upstream and treat yourself to a few juicy drops. Or, you can choose to avoid the Lower’s initial class III rapids, which can feel a bit daunting right off the bat, by putting in just below the bridge. There are several campgrounds, as well as dispersed camping, along the Tellico. Great Smoky Mountains National Park The Great Smoky Mountains National Park is situated about an hour away from Knoxville’s city limits. America’s most visited National Park, the GSMNP is renown for its biodiversity and wealth of hiking trails. With 520,000 acres of wilderness, it can feel a bit daunting to plan your first visit. We recommend starting with one of the classics: see the flame azaleas in bloom on Gregory’s Bald, stand atop Clingman’s Dome (the highest point in the park), or climb the stone fire tower on the top the summit of Mount Cammerer. You could also dive in head first by tackling a real challenge, like the exposed summit towers of Chimney Tops. Urban Wilderness Of course, as is always the case with Knoxville, you don’t need to travel far to explore the natural world. Just across the river, you’ll find miles of hiking trails inside the Urban Wilderness. While some sections of this multi-park conglomerate are bustling with people and activities, other places feel so tranquil and removed it’s hard to believe you’re less than five miles outside the city! Ijams Nature Center Ijams Nature Center is a great jumping off point to the Urban Wilderness. 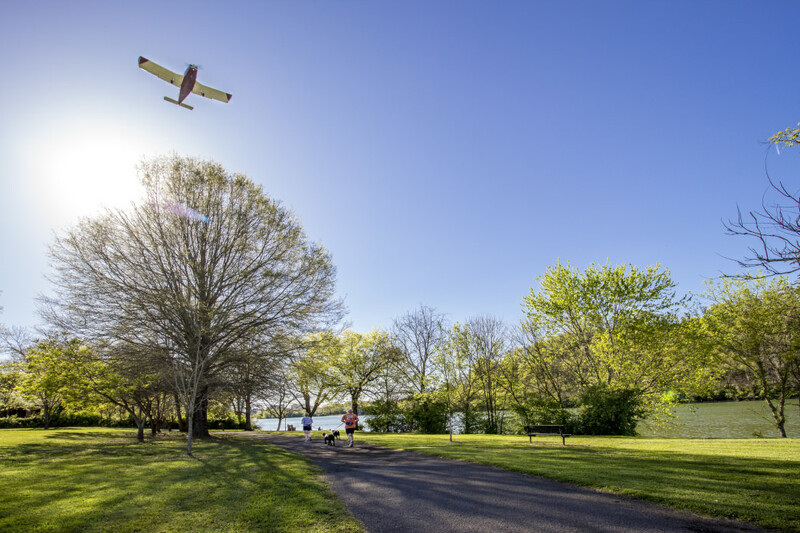 This park features 300 acres of forest and serpentine streams, as well as Mead’s Quarry, the Nature Center, and connections to the Will Skelton Greenway. Fort Dickerson Quarry Another convenient place to find trails and tranquility are the woodsy acres of Fort Dickerson Quarry. This small trail system is just a couple miles, beginning at the quarry parking lot and meandering through the forest. Whether it’s lit up with autumn colors or fresh with spring’s softest greens, the quarry is a lovely spot to explore all year long. In warmer weather, conclude your stroll with a swim in the quarry. Cades Cove, GSMNP With a treasure trove of wilderness unfurling in every direction, it’s difficult to narrow down a list of camping areas- there are so many of them! Let’s start with Cades Cove in Great Smoky Mountains National Park, an enchanting, wildflower-filled valley that’s encompassed by an 11-mile loop for running and cycling. Car camping is very popular here, so be sure and reserve your site during the peak season of May-October. Gee Creek Campground If you like falling asleep to the sound of rushing water, you have to stay at the Gee Creek Campground inside the Hiawassee/Ocoee Scenic River Park. Each of the 47 sites contains a fire ring, grill, and picnic table, and there is a centrally-located communal bathhouse. Gee Creek makes a convenient basecamp for a weekend on the water. Max Patch For an spectacular night out, it’s well worth the 1.5-hour drive out to Max Patch, a rolling, high-altitude meadow that is widely agreed upon as being one of the most beautiful spots along the Appalachian Trail. It’s not car camping, but it’s not exactly backpacking, either—it’s more of a hybrid. The climb from the parking area to the crest of the field is taxing, but very short, so why not bring along that fancy camp espresso maker and the extra-fluffy sleeping bag? At sunset, the wrap-around mountain view is nothing short of sublime. Once night falls, the stargazing is (quite literally) out of this world. Outdoor Knoxville Adventure Center The Outdoor Knoxville Adventure Center is located on Volunteer Landing along the Tennessee River, making it easy to rent your gear and go. This fantastic operation, made possible by the Legacy Parks Foundation, is an amazing resource for anyone interested in becoming involved in the local outdoor scene. The Adventure Center offers maps, clinics, and information on various outing clubs, along with bike and boat rentals. River Sports Outfiters River Sports Outfitters is the city’s premier, locally-owned outdoor retailer, and is fully-stocked with all the favorite outdoor brands. You can walk in empty-handed and walk out completely prepared to tackle mountains, rivers, rocks, or road. There are several outposts that rent boats, bikes and backpacking gear located throughout the city, including Ijams Nature Center and Seven Islands Birding Park. River Sports also has an indoor climbing gym at the Sutherland Avenue location, with lead and top-roping opportunities, as well as a bouldering area. A hub for the city’s adventure-minded community, River Sports hosts frequent pint nights, community bike rides, group paddles and fun runs. Blue Mason Coffee Whether you’re kicking off a ten-miler through the GSMNP or fitting in a quick paddle before work, Blue Mason Coffee is a great place to start the day. The interior of this small, locally owned café is warm and cleanly designed, and the air is fragrant with freshly baked pastries and rich espresso. One of Blue Mason’s perks for the outdoor community is its convenient location next to River Sports Outfitters. Beardon Beer Market As all bonafide outdoor-lover knows, every good day begins with coffee and winds down with craft beer. Wrap up your day as the locals do—sharing a cold pitcher at the Bearden Beer Market. Located along the Third Creek Greenway, this dog-friendly, family-friendly outdoor beer garden is one of the city’s most popular hangouts. An added bonus? It’s open 365 days a year. Copper Cellar The Copper Cellar is a classic Knoxville restaurant. Stained glass windows, funky chandeliers, and oak paneling create a cozy atmosphere that’s a bit more lux than your typical post-adventure eatery. The menu takes a fresh take on the traditional steak house, as well as an award-winning brunch. Knox Mason"Hyper-local" is the buzzword flying around Knox Mason, a hip downtown eatery located on the historic 100 block of Gay Street. The menu shifts with the season, and the delectable dishes take a modern spin on comfort food with ingredients are sourced from local farms with flavors from around the Southeastern United States. Pork rinds—yes, pork rinds—in bourbon barrel smoked paprika have never tasted so good.